A tiny doll left by an unknown mourner rests on a headstone at the Garden of Innocence in Mountain View Cemetery in Fresno. 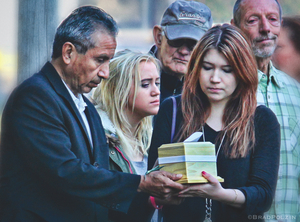 Fresno County Supervisor Henry Perea, who was instrumental in establishing Fresno County’s Garden of Innocence chapter, gently and and emotionally passes an urn to fellow mourners. Knights of Columbus in full regalia before the opening procession. A regal procession of Fresno Police and Sheriff department honor guards, Knights of Columbus and a bagpiper open the service. Community members and volunteer honor guards from the Fresno County Sheriff’s Department stand in quiet witness to the interment. The grandmotherly woman gently took the handmade box from the person to her right, looked at the nameplate and softly pronounced the name. “Jill-Elise,” she breathed, tracing a cross lightly on the lid and then kissing it before passing it on. She repeated the ritual seven more times as each urn came her way: Stella, Aurora, Isaac, Jeremiah, Christopher, Samuel and Nehemiah. 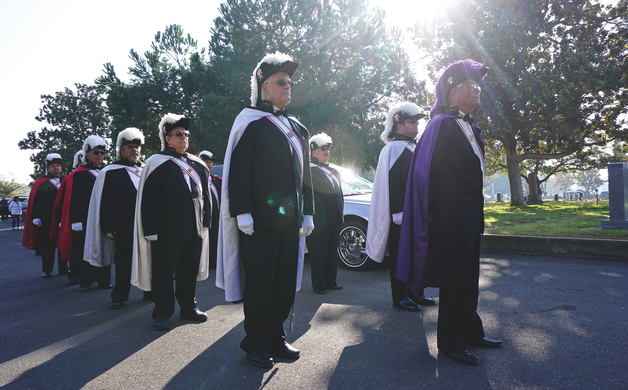 With kisses, poetry, music, honor guards and tears, eight abandoned babies were laid to rest Nov. 14 in the Garden of Innocence in Mountain View Cemetery in Fresno. Garden of Innocence, a nonprofit, all-volunteer organization that began in Carlsbad in the late 1990s, now has chapters in multiple cities throughout the U.S. Their purpose is simple: to inter abandoned, anonymous children whose remains ended up at county coroner’s offices with dignity, love and, most fundamentally, names. “I named the first [Fresno] baby Grace, after my mother,” said Roy Bell, the director of the Fresno chapter of Garden of Innocence. Fresno County held its first service in 2012 after Garden founder Elissa Davey approached the county board of supervisors about establishing the program locally. Previously, the abandoned or unclaimed remains of children were buried with adults at Fresno County Cemetery. On this morning, glorious fall sunshine was the backdrop for the service conducted by a cross-section of the Fresno community. Bell, the retired owner of Bell Memorials and Granite Works in Clovis, became involved when his company was approached about donating memorials. He has since donated every headstone. His wife, Donna, is also on the local Garden board. The outpouring of love in the form of donations and time is generous and ongoing. Mountain View Cemetery Manager Elaine Tosh donated the space for the Garden and designed its features: a white, butterfly-shaped iron bench; a black, wrought-iron, child-sized fence and gate; a butterfly park. Bell Monuments donated a large statue of a vigilant angel. Another statue, of two children on a bench, sits serenely under a tall palm tree. On this morning, glorious fall sunshine was the backdrop for the service conducted by a cross-section of the Fresno community. 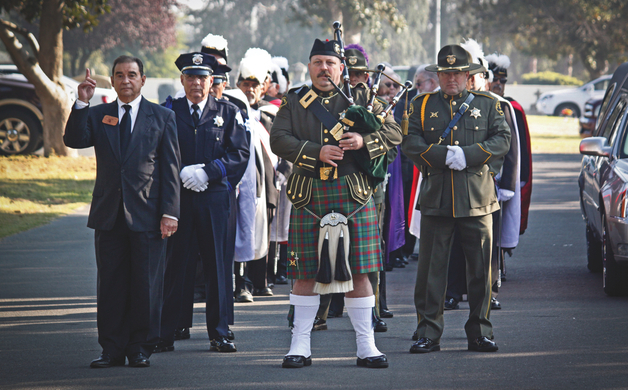 Bagpiper Ed Mayo, in ceremonial dress and intoning “Highland Cathedral,” led a dignified, white-gloved procession including members of Knights of Columbus, in full regalia; Fresno County Sheriff’s deputies and Fresno Police Dept. officers, in formal uniforms with gleaming buttons; and members of the Fresno and Clovis Elks lodges, in their immaculate inaugural tuxedos. Fresno County Sheriff Margaret Mims, whose department this year assumed management of the county coroner’s office, and Fresno County Supervisor Henry Perea, who has attended every ceremony since the first one in 2012, made brief, heartfelt remarks. 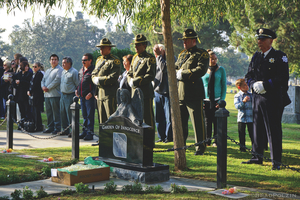 “This is such a part of who we are, as people,” said Perea, who, after losing his father, mother and the mother of his son within six months of each other several years ago, bestowed his father’s name on one of the babies previously interred. Community members are given the privilege of naming the unclaimed children. “When I come out here to visit my dad, I also visit [the baby] Julian,” he said. A Circle of Love formed by about 100 members of the public, many of whom learned of the service through Facebook posts. Each urn, bearing remains snuggled in a handmade baby blanket and accompanied by a Beanie Baby, and adorned with nameplate, a ribbon and a carnation, was lovingly passed around the circle. Small children accompanied their parents, teenagers and elderly people stood side by side. A Vietnam veteran sporting a vest festooned with badges stood quietly in the circle. “A typical funeral is sad because you have some connection with the loved one. This burial, in a strange way, makes you smile,” said Bell, and one attendee, Sister Phoebe Grace of St James' Anglican Cathedral, in her white habit, agreed. Bell shared the story of one baby, whose nameplate had been inadvertently misspelled. He contacted the maker, who asked Bell to bring in the urn the next day for a new plate. After prayers were said and poems for each child, written by community members, were recited, and after the vocal/guitar rendition of “You’ve Got a Friend” by Dawn Delozier and Chris Eacock; and after Stanley Mackey’s passionate a Capella gospel performance; and after Ed Mayo’s haunting “Amazing Grace” on bagpipe; and after each urn was placed, two to a grave, a basket of rose petals was produced and the mourners scattered them on the graves new and older. A slight breeze stirred the trees and a flock of white doves was released, three flying to the east, representing the newest Garden residents, and the rest circling the cemetery. Written by Janelle Schneider. Photos by Brad Polzin.